I talk to Sam filled with ambivalence, fearful I will disappoint him, but equally if not more fearful he will have a lousy time here, as I am having a lousy time here, and for me the trip feels over. I think of the Kenny Rogers’ song, about knowing when to hold ‘em and when to fold ‘em and about how hard it is to fold - because once you’ve folded you’ve surrendered, accepted defeat, ended your engagement in the hand, come to accept that although possible, the odds of improving your position are just too slim for you to remain in the game, and you surrender hope to practicalities and probabilities. No good player throws good money after bad, and those players who win most often fold early most often, not seduced by the remote statistical possibility of improving a particular hand they've already become attached to, knowing that while every hand can be a winner, every hand is more likely the loser, and, in this regard, hard as it is to fold Sam’s trip to Africa cards, I’m convinced it is the right decision for Sam that forgo the trip, notwithstanding how much saying so fills me with regret. The view of Boston approaching as our plane glides into Logan over the harbor and the Harbor Islands, over Deer Island with it’s sad history of abuse and Winchester is one of the most beautiful landing approaches anywhere on the planet. My fabulous 26 year old son meets me at the airport. We go for coffee, catch up a little - friends, ladies, football, basketball, work, money - the important things in life - explore the purchase of a car for him now that I’m home and need my ride back, what his short and long range plans might be … playing semipro ball in Europe? going to a grad school where he might still eligible for NCAA D1 competition? It's another plot where the main character doesn’t know what’s gonna happen next. Sam treats me to dinner, good Vietnamese food. We see a fascinating violent allegorical movie about slavery - Django Unchained - that we both like. I wrote a brief review, posted on this blog site under "Other Writings." I predict Jamie Foxx’s line, “The D is silent,” will enter our vernacular like Eastwood’s, “Make my day,” did. We hang out after the movie with his mother (my lovely ex, Lynne) at her home in Jamaica Plain. It’s comfortable - at least for me it is - and everything I feel about her remains the same … how worthy of love she is, what a nice person she is, what is and isn’t there, how I am freer to pursue what I want absent the ballast she provided, how devoid I am of anger and resentment free of the constraining anchors and dissatisfactions I felt I had in the marriage. Lynne is said to believe we just "drifted apart." I’m okay with that explanation … although in my narrative I did the drifting and she did the more or less honorable holding fast. When I finally take my leave and begin my drive down to the Cape it's around midnight. My good son has filled the car’s tank with gas. Was it really me down on my knees inside a church in the Ethiopian town of Debre Libanos less than two weeks ago, me who climbed to the cave where good Saint H hung out all those years in the thirteenth century standing on one leg and being fed one seed a year by the nice bird who supported the good saint’s efforts, the guy who was just in Mali, Senegal, Madrid, and is now back home … whatever home means … on the sandbar shore with a view of the frozen bay? The house still in renovation mode on a little project that started when I left and should have been long ago concluded. But I get over that fast when the painter and plumber appear. Snow on the ground. Walking barefoot to bring in firewood and get the wood stove going. Starting to clean up. Writing memos to clients whose trial begins in about six weeks. Doing laundry. Watering houseplants. Measuring out pills for the week. I hang out my new shingle - “The Writer is In” - and the write. I play at being the housekeeper and even the cook. I listen to a lot of music and don’t criticize myself for not doing yoga or taking a walk. I clean things, organize and put away things. Rest. Spend a lot of time feeding the fire. The house smells of smoke, incense, and paint. I don't drive the car or make a phone call. I barely step outside except to bring in more wood. - and, of course, to one’s self, to loving how sincerely you, yes I'm talking to you, are trying to be the very best person you can be, kind, gentle, strong, trustworthy, engaged, interested, curious, active, grateful to yourself for the effort you extend, grateful for your/our/my commitment to doing the practice, to a grateful awareness of what good, loving people we actually are. Yes, gratitude. And Namaste to you too. And since the sign on the door into my office now reads, “The Writer is In,” herewith 2 last vinettes from Madrid ... and then perhaps good-bye to Africa for a while. 1. I’m walking late at night through the somewhat busy streets of Madrid when I approach a very chunky obvious woman of the night in short skirt and tights standing on a street corner with her eyebrows. She catches me looking at her, her excess makeup, her sad alert face, and says to me in Spanish, “Come on. Let’s go.” And I say, “No, thank you.” Yes, I really do say, “thank you,” ever the well trained, polite, courteous if not courtesan older man. And she, of course, says, “Why.” And I can say, in Spanish, which gives me immense pleasure, “Because I have a woman I truly love very much.” And, although I know this is purely my projection, she looks at me admiringly, respectfully, acceptingly, as she smiles and turns away. 2. I am on the Metro headed for the Madrid airport and my flight home early on Sunday morning. Across from me seated alone on the train is an African woman staring at me. Very odd for an African woman to be starting at me, especially since she is obviously not a “business” woman, and when she sees me looking back at her she points to my shirt, a lovely purple T shirt I bought for three dollars at the Monastery of Debre Libanos in Ethiopia that has Amharic writing on it saying “Debre Libanos,” that I already deeply prize, but has faded with multiple washings very quickly, as has the obviously Ethiopian Orthodox cross on the front of the shirt faded, such that the shirt appears old and well worn. “No, I bought this shirt when I visited the Monastery at Debre Libanos,” I say laughing and pointing to the lettering on my shirt. The city of Madrid is so alive, so vibrant, so clean. There is so much good public transportation. The architecture is phenomenal. The streets are wide and thronged with people who speak beautiful Spanish. The food is fantastic. There is a vibrancy, a liveliness that is alluring. I wish Joy was here to share it. I drink too much coffee. I eat only Spanish ham. I spend hours at El Prado, truly a mind boggling museum, whose only competition I see in this city of four million is the not equally well known, but truly equally bustling and fantastic Museum of Ham, where I also sample the art. El Prado displays what are truly miraculous talents in vast numbers of works, all so well preserved, mostly 1,000s of oils over three or four hundred years old, all by men - Rueben, Goya, Rembrandt, Caravaggio, Durer, Brueghel - portraiture paintings, religious paintings, paintings which change perspective depending on the angle from which they are viewed, paintings with far more than a thousand figures and a thousand faces, paintings of one dog, one horse, one cardinal, one Christ, bloody scary paintings, paintings of Maja Naked and Maja Clothed, Spanish paintings from as early as the 1100s, Italian paintings from the 1300s, front lighted paintings, back lighted paintings, the details almost beyond belief so realistically do they appear, the range of expression on the faces, the blacksmith’s shop, how alive and full the larder, down to a red boiled lobster. But most of all as I stroll the streets of Madrid, I’m ready for home, and again concerned about what I will “do” when home to fill the time and feel useful, relevant, and with purpose, besides my one engaging upcoming trial, my summer gardens, my occasional visitors, and Joy. I’ve become such a loner, perhaps the most loner person I know, sans clients, students, men’s groups, study groups, card games, church socials. And although there is always the dream of writing in a more focused, useful, disciplined way … and/or of doing and being yoga in a way that truly deepens me … and/or contributing to the effort to promote greater social justice in a substantial way, knowing war and the inequitable distribution of wealth still turn the human wheel and that, at least theoretically, it could so easily be changed. But the bottom line for me is that this trip is over … and although I don’t want to be on the road right now, I’m also really not sure I’ll find home at home. And, of course, the ham was also really fantastic. Camp Sizanani - starts 12/7/12. This whole voyage starts in part with Phil Lilienthal as guide and manifestation of the Great Spirit. So let's start there. Coming soon. 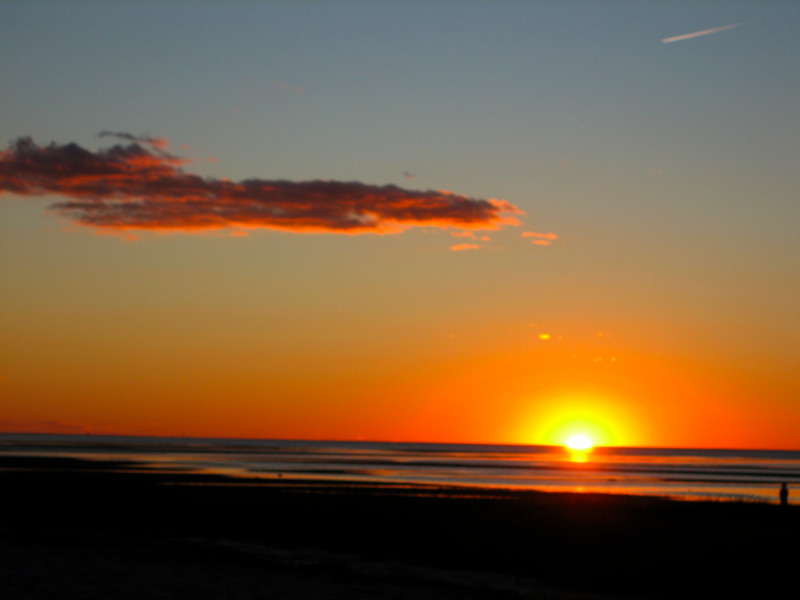 I love Cape Cod. It is sweet, and soft, and impermanent. I return here for two weeks - after the San Francisco visit, which I saw as such a triumph - for what seems like too few days. I come home to Joy, of course, and my most lovely cottage, about to get lovelier, and my most lovely son. To Thanksgiving, which for me is a National Day of Mourning, because, as we say, every day is a day of thanksgiving, and only some need to be marked for mourning, Columbus Day, and Memorial Day, for example. These are the descendants of Massasoit, the Wampanoag chief betrayed by those lovely Pilgrims seeking religious freedom, his son's head displayed on a pike in the village of Plymouth for twenty years after the white warriors returned home from Connecticut to celebrate the burning of 70 Pequot women and children in the first Thanksgiving. Yet the Wampanoag are still here, their language still spoken, their children still proud, the Earth still their mother, offering hope and good wishes to all, feeding 300 guests, calling for an end to war, offering hope and fellowship to their brothers and sisters struggling to protect their land and preserve their culture ... in the Americas, in Palestine, and in all places where the guns and warships of the oppressor threaten the lives of the indigenous people. I am mostly baffled at what fuels my desire for a rendezvous with, Owen Renik, a H.S. classmate I haven’t seen in 54 years, and who I honestly don’t recall having had one conversation with, ever, or indeed even a shared activity, ever, altho I was surely aware of his existence, viewed him as of a different class, almost waspy, and a competitor. He was not from my neighborhood, i didn't "hang out" with him, and I knew nothing about him other than what he looked like and what I projected onto him, which at that age I expect I saw as somehow "known" by me. And although I would proclaim I am not that attached or attracted to most of my high school experiences, nor to my high school cohorts, the fact is I have gone to the 10th, 20th, 30th and 50th class reunions. Dr. Renik has not, and I did not ask him why, although my guess/projection is that his h.s. experiences and mates are of little to no interest to him. And I "imagine" I get it. Nonetheless, I am interested in meeting him, and in attaching a real person to his name and face, and I have worked on making it happen over email for about a year, telling him of my interest in meeting him and how I'm often out in San Francisco, and him suggestion that when I was next out here to let him know and he would put some time aside for me. Here's what I knew about Owen Renik before our rendezvous ... nothing. Here's what I "know" after our rendezvous at NAME - a very lovely lounge/bar in the neighborhood of his office around Sutter and ?? He is currently a training and supervising analyst at the San Francisco Psychoanalytic Society. He was editor and chief of the “Psychoanalytic Quarterly” for a decade and Director of Training/Associate Chief of the Mt. Zion Hospital Department of Psychiatry. More than that he is the father of two girls/women, one a pediatrician in S.F.,m and the other a geologist, living in Texas, where Owen's current woman/partner is. Neither have children and although he recognizes it would be a lovely experience to have, he is not attached to the notion that if it doesn't happen he will suffer. Indeed, although I understand there were times in Owen's life when he did suffer, and was confused, his overall experience of his life is that he was/is a remarkably fortunate man who lived a nice life. And on this one occasion of our meeting I found him to be as lovely a man as you are likely to meet. Fit. Trim. Nice haircut. T shirt and sport jacket. Works out. Girlfriend in Texas. Daughter in Texas. Other daughter pediatrician. First, however, San Francisco. Sort of a practice run at living out of my backpack again. Far from home, very safe, yet "on the road" enough to test out my traveling skills, my memory and organizational skills, my back, my heart, my laptop. More than one person who has observed the planning and deliberation that go into preparing for any of my low budget comings and goings has said, "I thought you were such a free spirit." To which I always reply, "You can't imagine how much work it takes to be a free spirit." San Francisco remains a most amazing city. The weather can be change very quickly and frequently over the course of a day. Bright sunshine in cloudless skies often followed by rain, sun, rain, fog, and a special Pacific drizzle that leaves me cold to the marrow. In the summer the plants here want for water. In the winter the earth is lush and Mediterranean flowers bloom everywhere. San Francisco is also, of course, the home of my beloved 43 year old daughter, her husband, and their two delicious children. And before I start any of these major voyages - which are always also possibly where my tale will end - I want to see them. Parts of San Francisco are even in strange ways how I imagine parts of Africa will be, walking on Mission between 17th and 18th after midnight, the taquerias open, the 24 hour stores, the smoke shops, the homeless people, the haggard prostitutes, the derelict junkies and the smooth talking junkies ready to exploit me and any other opportunity that presents itself. I am currently holed up in an old SRO (right) for 70$/night with my laptop and my writing. But the outside world calls me to set this down and otherwise engage. Grandchildren. Daughters. Pumpkins. School plays. Halloween. World Series championship celebrations. Ex-wives. 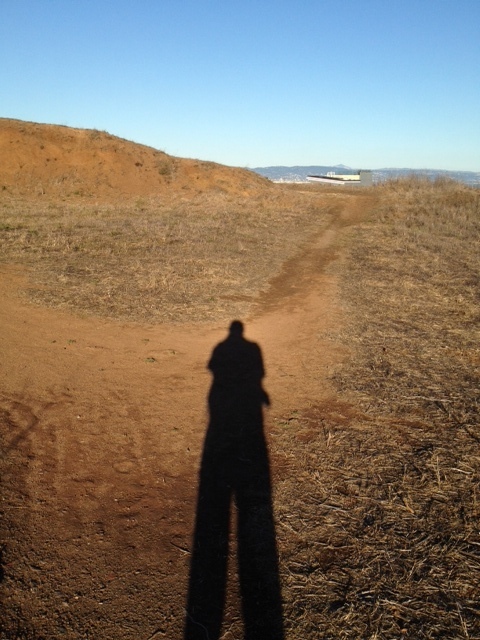 I imagine that the two photos below - of the dwelling taken from the west side of Bernal Heights, and of my shadow photographed facing east in late afternoon - could have been taken in Africa … or maybe not. It's part of what we're going to find out, this 72 year old, with arthritis, atrial fibrillation, the residue of a law practice, macular pucker, and a fabulous life partner very into her work. www.alinearchitacture.com. I live on Cape Cod which I must tell you is a horrible place, that I advise all visitors avoid and stay away from (unless they are good personal friends) what with ticks, lyme disease, poison ivy, street crime, and sharks – besides the traffic is terrible, the weather unpredictable, and the crowds unmanageable. Go to Long Island. Or Deer Island. Or the Thimble Islands. Remember, Cape Cod is a shifting sand bar that will be washed away in another 15,000 years. Property values are sure to fall. Don’t visit. Don’t buy. There are thousands of absolutely amazing, charming, comfortable, easy, beautiful places to live on our planet, thousands. Visit them. Turn back before you get Cape sand in your shoes. The spirit of the people who lived and hunted here 500 years ago is abounding. So too the whale, the dolphin, the crab and their kin. Turn back before it is too late. I finally get out of my SRO room having spent the morning corresponding, writing, exploring the world available thru my computer and the internet, news, poetry, photo exhibits, blogs. Hard to put aside, and after a few blocks walk, and a couple of buses, and I’m back on the computer in a Peet’s Coffee waiting for my outrageously expensive outpatient medical appointment, because insurers don’t cover optional things, like travel immunizations. Oh well. Obsessing about the question of what might make these writings interesting when I’m not in Africa, or elsewhere on the road less familiar. I saw a new blog site today entitled, “The Adventures of Amanda in trying to organize her life.” Not what I want to be writing. But sitting in a Peet’s drinking coffee goes only so far in holding a reader’s attention. I think of myself as an ethnographer, trying to describe what I see of the culture and environment I am encountering without judgment or presupposition. I also think of myself as being on a "spiritual" quest, that experiencing spirit wisdom and sacred wisdom, whatever they turn out to be, if noting more than a greater attuning of my sensory instruments to the vibration of the others' sensory instruments, the other hearts beating, the other molecules spinning in ritual dance. I am also no longer sure "the mind" is contained inside the skull. But let us move on. I think of myself as being on a "spiritual" path, on a spiritual quest, that experiencing spirit wisdom and sacred wisdom, whatever they turn out to be, if noting more than a greater attuning of my sensory instruments to feel the vibration of the others' sensory instruments, the other hearts beating, the other molecules spinning in ritual dance. But let us move on. I am planning on traveling in sub-Saharan Africa and hope to be there for two full months. I intend to begin my journeying there in late November, 2012 going from Johannesburg, SA, where I first arrive and will stay a day or two to recover from the flight, to Meseru, Lesotho. I have a lot of work to do before I depart. And it is not gratuitous to say I'm not as young or fit as I used to be and that my aging spurt since returning from my last voyage requires immense accommodation including carrying a complete pharmacy of daily and emergency medications that take up half my little pack. I record my "plan" here to see how much comes to pass, leaving boston 11/26 to Joberg, SA and some local travel including Lesotho b4 returning to Joberg and b4 camp Sizanini starts. I plan to fly from joberg to dar es salaam tanzania on the afternoon of 12/19/12 with my sister Sheryl, who will also have been at the camp. in Tanzania we plan to go on safari, and then on to Zanzibar, after which she’ll return home and I’ll go on – inshallah – to Moshi, Arusha, the Serengeti, Olduvai, Ngorogoro, and from there overland to Nairobi –despite state department warnings – and then on by air to Addis and Lalibela in Ethiopia, letting Eritrea go, based on state department warnings, and maybe if there is time to one west African country (Senegal?) … and, if sam is in euro, to come home via a visit w him and a return flight to boston probably around 2/4/13. Man tracht got lacht. My sister Sheryl plans to rendezvous with me in Joberg in early December before we spend 10 days as international volunteers at Camp Sizanini, http://www.globalcampsafrica.org/programs/, a camp aimed at enhancing the lives of vulnerable South African boys and girls aged 10 to 15 by providing HIV/AIDS prevention education and training through high-impact residential and day camp experiences and continuing education. I trust there will be more to say about Sizanani anon. Camp ends 12/18, after which Sheryl and I fly to Dar es Salaam, Tanzania, and from there on to a tenting safari deep into the bush. http://www.kwihala.com/ruaha.htm. Christmas morning we fly from Kwihala to Zanzibar, after which Sheryl will return home and I’ll go on – inshallah – to Moshi, Arusha, the Serengeti, Olduvai, Ngorogoro (all inTanz), and from there overland to the Masai Mara and Nairobi, in Kenya – despite U.S. state department warnings – then on to Addis and Lalibela in Ethiopia, (but not Eritrea - in deference to U.S. state department warnings), and maybe, if there is time, to Senegal in west Africa, returning home around 2/2/13. But as I need to say ... and as we all know too well ... man tracht got lacht. So I’m counting on your good wishes. And the good intentions of the guides.